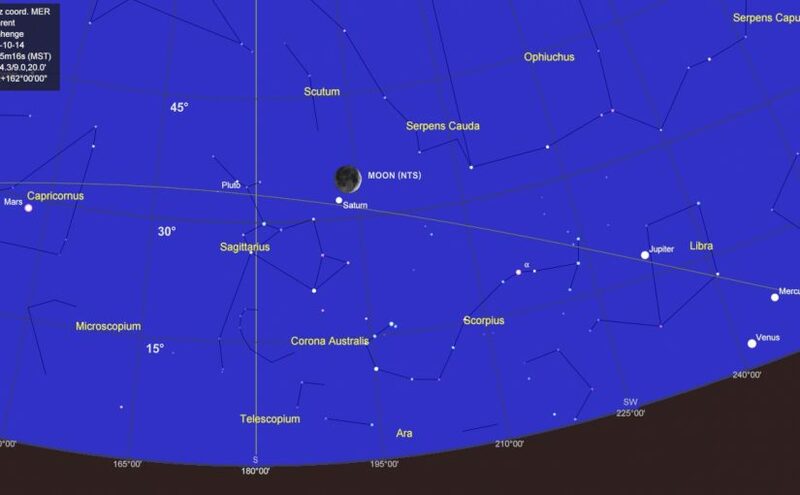 The southern sky as it will appear just after sunset on October 14. Click for a larger version. In the early minutes of dusk, if you have clear skies and an unobstructed horizon, all five planets visible to the unaided eye will be spread across the southwestern sky. Truth be told, Venus and Mercury will be tough — the former for its low elevation, the latter for its low brightness. But I’m still calling it a “quintuple” since, even if you don’t spot Venus and Mercury, you’ll have a Crescent Moon and Sagittarius to admire. Mars is still close but receding from Earth. It’ll show as a bright orange dot with a hint of dark surface markings. Saturn’s rings will be visible, along with its largest moon Titan. 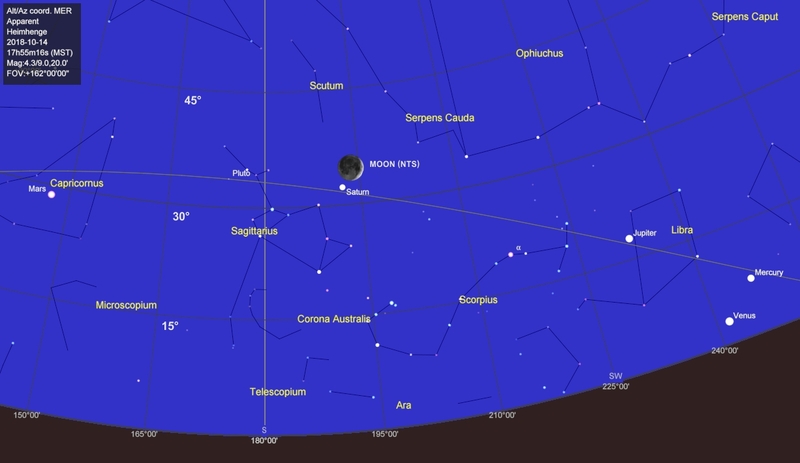 The Crescent Moon will show sharp detail along the terminator, as well as earthshine on its unlit side. Jupiter will show faint equatorial banding and several of its moons. Venus and Mercury will appear as slightly gibbous phases (if you can see them at all). The constellation Sagittarius (sometimes called the “teapot” based on the asterism formed by its brightest stars) is just below the Moon and Saturn. It’s inside the vertical band of the Milky Way, so it’s surrounded by many clusters of stars easily visible in binoculars. Of course, observers with telescopes will see even more. But casual stargazers using unaided eyes are still in for a visual treat. If your weather is clear, I urge you to go outside with a comfortable chair, turn off all the lights, enjoy the sunset, and then try to spot these objects as they become visible. You’ll probably see the Moon first, and that can help guide you to the locations of the others via a process known as star hopping.